Strangely enough both of these letters came within a day of each other sharing the same question regarding a thick fermented garlic brine. While they look all wrong both these ferments are fine. It happens sometimes with garlic. We don't know the reason behind it but these ferments. It is not mold and we haven't found that it happens from a process error. More likely it has something to do with the variety of garlic. I have done a lot of variety testing and found some varieties do this while others do not. While this brine unsightly, are perfectly safe and taste good as well. What a helpful resource your site as been! Thank you for offering to give us individualized advice. I’ve had a garlic ferment in my cabinet for about 2 weeks. I’ve checked it every other day. The garlic is completely submerged below 3 clean rocks. I’ve checked the ferment every other day, letting out the air. Today when I checked I noticed this milky white stuff floating at the top ¼ of the jar, more around the rocks, less the garlic. I’m attaching 3 pictures and my attempts to draw lines to what your eyes should focus on. Is this the start of mold growing? Or is it something else? The ferment has appeared healthy to date, a lot of bubbling every day, and a few cloves have started to turn blue. I started a batch of fermented garlic and it just hit the 4 week mark. 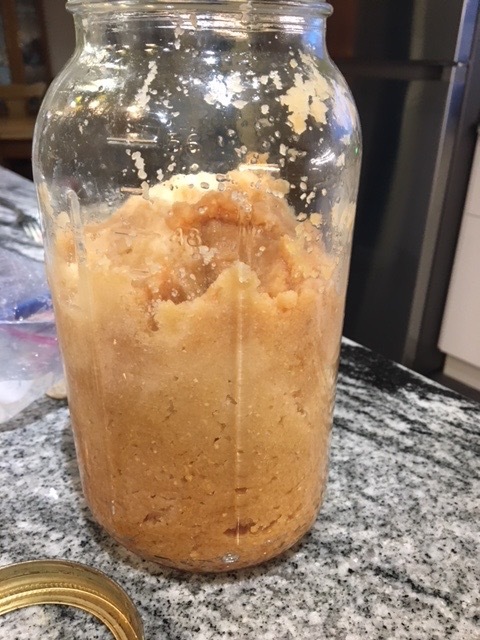 It had been doing great and was bubbling lots, but a few days ago (maybe a week) I noticed that the bubbling had mostly stopped and the brine turned kind of gelatinous. You can see small solid chunks throughout the brine. The smell and color still seem fine, there’s no mold, and I think it’s ok, but am unsure since this is my first long-term brine. Is this safe to eat? We've consolidated the answers to both of these into the text above. Thank you so much for your kind invitation to send in fermenting issues. I am an eager newbie to the world of fermenting. Garlic has been my first foray into this world. Please see attached an image of my attempt. I'm concerned about the colour the brine has turned. It is decidedly green and there is a strong garlic smell emanating from the closed jar. Is this to be expected? 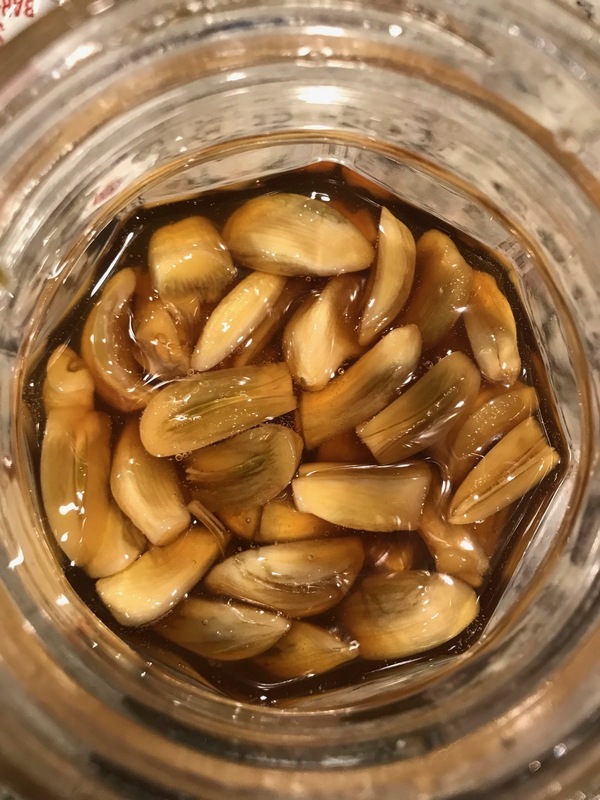 I understood the cloves themselves may turn green or blue during the process but not the liquid? I'd be grateful to know what has happened and what I can do to get a good jar of ferment. Thank you in advance for your assistance. Ah yes, the blue-green hue. You are right it is a little different seeing it in the brine. My guess is that the brine is thick with the garlic sugars. The whole cloves we make can have a very thick brine and that the blue-green is actually on the garlic that is now in the brine. Sometimes when they sit in the fridge for awhile the blue will work itself through. This ferment looks okay to me but you be the judge (and trust your gut). If it smells strong like garlic, that is normal, if it smells strong like bad, compost, or whatever, then I would say it is bad. It should also smell a bit pickle-y. It doesn’t always happen so don’t be discouraged and again I think they are fine, when you are ready to taste them, you will know. Pickle-y acidic garlicky is good, any thing else is not.